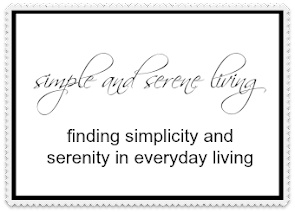 F Simple and Serene Living: have you? Have you suffered a loss? We all suffer losses in our lives, and we grieve, but we never know what is around the next bend. Beauty can grow anywhere. So, don't ever give up on finding happiness, because you are special and you deserve it. I wanted to let you know that on Tuesday I sent the paperwork off to North Carolina to file a civil suit to try and find out what happened to my property. You can read more about that here. I don't know if I will ever see any of it again, but I am hoping that it will give me closure. I am also dealing with some serious issues with some family members (I seem to be the go to person to try and solve them) while trying to find a job in Atlanta and figure out how to get moved in the next couple of months. I am going one step at a time, knowing there is beauty that will grow within me. Love the picture of the flowers in the tree! You must be a very special person for family members to turn to you for help. Best of luck with job looking in Atlanta - I do hope that you find what you are looking for. There certainly is something for everyone here!! Wow girlfriend! Your plate is overflowing! I pray all goes well with everything you have going on. I love this post, very inspiring and beautiful. I am so sorry to hear about all that you're having to deal with right now. My heart goes out to you. Glad that you're trying to keep a positive attitude about everyting though. You are so right about never knowing what will be around the bend. When I'm going through a lot of stress, I try to remember the saying "This too shall pass". I know it will for you. Remember, too, that what you give, comes back to you. All of your help to others will help you as well. We were just talking about that this morning. We all go through hard times in our lives but we have to figure out a way to deal with them and go on. And then there are the tragedies that we are beyond our control. We can pray about all of them. I know you have a lot to deal with this year and I'm wishing you the very best. Sending you some extra hugs this morning! These are heavy burdens, Laura. May you find closure and peace. Hope you are able to find the peace you seek! You have so many burdens now, Laura. I love that you keep a positive attitude. Praying that things all work out for you soon! Blessings to you Laura, hope you find peace. I admire your courage and resolve. Yes, life does have a way of working things out. Life sure dumps a lot on us at one time doesn't it? I am so glad that you are pursuing this civil case, they just can't go and break your trust like they did. I love this post Laura. My granny always told me "That the lord wouldn't give us more than we could handle but she dang sure wished he didn't think she was that strong" She was quite a gal. The picture is just amazing and btw, I have a home just sitting empty in Atl area if you need a place to rest your weary head. I'm seriously offering if you need it just say the word. I so hope the civil case turns out in your favor. Just like the picture of the damaged tree with the beautiful blossoms settled in its wound, there is always beauty that will come out of any ugliness or problems. The best to you. I do hope you get your property back and that the civil suit will work toward that end. And I wish you all the best in finding a job and getting moved! Laura, I am praying for you. It is so hard when we lose our "things" that we thought were safe. We just feel violated. We lost "stuff", too, after storing it in a SAFE place and I didn't even realize things were missing until several months later. So sorry that you have so much to deal with. I hope that things go in your favor and you can have closure. The same with the family issues. I am so sorry to hear that all this us going in and I wish you peace and closure. Seems many of us are fighting battles these days.. Stay strong and I will pray for you. Hugs, Laura! You are dealing with so much. Thank you for the beautiful image, and the timely reminder to keep moving forward. Laura this photo says it all! I am proud of you for filing the papers, even if you never see your property again you have taken steps to say, this was not OK to do to me!! I know this move is looming large and I hope all works out. Sending you a hug! Your story is so unbelieveable. and bless you with even more. The picture of the tree with the flowers are lovely. I guess we do forget there's beauty all around us when things are not going well. I hope everything works out for you. I find you very courageous and the post is beautiful and full of hope and positive energy. It is unbelievable all you go through and you are one tough woman....I love the beauty of the flowers with the tree. Great outlook on life.